Our agents are committed to finding a home for their buyers that makes their heart skip a beat, a home that they immediately can picture themselves spending the rest of their lives in. We asked Marco Rufo, an agent with our Pacific Palisades office, for his input on what he thinks it takes for a home to make a buyer fall in love. Though appliances are important, Marco tells us that countertops are really what set the mood. Granite is and has been on the list of must-haves for many homebuyers, but engineered-stone products primarily made of quartz are beginning to replace granite in high-end homes. For the ladies: A large center island in the kitchen. For the fellas: Full audio and lighting control system in the house. Whether you are selling, buying, or are currently a homeowner, these are two features that homeowners these days are searching for. Homes with a pool are more desirable if they also have a spa. When considering your outdoor landscaping, real grass is still ideal, however turf is being used more often. Backyards with lush landscaping and accent lights are also sure to catch any buyer’s eye. An outdoor barbecue station is always a good idea, but make sure that you also have a large countertop and space for stools. Ideal home features: A home with a grand entrance and open floor plan with an East Coast traditional style. Why Marco loves working in real estate with Berkshire Hathaway HomeServices California Properties: He loves the agent and broker network, the accessibility, and the brand and image that the company have. It’s a slow Sunday morning. You’ve just brewed your Nespresso and popped open your laptop to check out the latest home listings before you hit the road for a day of open houses. You’re DIYing this real estate thing, and you think you’re doing pretty well—after all, any info you might need is at your fingertips online, right? That and your own sterling judgment. Oh, dear home buyer (or seller! )—we know you can do it on your own. But you really, really shouldn’t. This is likely the biggest financial decision of your entire life, and you need a Realtor® if you want to do it right. Here’s why. Want to check the MLS for a 4B/2B with an EIK and a W/D? Real estate has its own language, full of acronyms and semi-arcane jargon, and your Realtor is trained to speak that language fluently. Plus, buying or selling a home usually requires dozens of forms, reports, disclosures, and other technical documents. Realtors have the expertise to help you prepare a killer deal—while avoiding delays or costly mistakes that can seriously mess you up. The Internet is awesome. You can find almost anything—anything! And with online real estate listing sites such as yours truly, you can find up-to-date home listings on your own, any time you want. But guess what? Realtors have access to even more listings. Sometimes properties are available but not actively advertised. A Realtor can help you find those hidden gems. Plus, a good local Realtor is going to know the search area way better than you ever could. Have your eye on a particular neighborhood, but it’s just out of your price range? Your Realtor is equipped to know the ins and outs of every neighborhood, so she can direct you toward a home in your price range that you may have overlooked. And it’s not just about how much money you end up spending or netting. A Realtor will help draw up a purchase agreement that allows enough time for inspections, contingencies, and anything else that’s crucial to your particular needs. Realtors might not know everything, but they make it their mission to know just about everyone who can possibly help in the process of buying or selling a home. Mortgage brokers, real estate attorneys, home inspectors, home stagers, interior designers—the list goes on—and they’re all in your Realtor’s network. Use them. Not every real estate agent is a Realtor, who is a licensed real estate salesperson who belongs to the National Association of Realtors®, the largest trade group in the country. What difference does it make? Realtors are held to a higher ethical standard than licensed agents and must adhere to a Code of Ethics. The thing about Realtors: They wear a lot of different hats. Sure, they’re salespeople, but they actually do a whole heck of a lot to earn their commission. They’re constantly driving around, checking out listings for you. They spend their own money on marketing your home (if you’re selling). They’re researching comps to make sure you’re getting the best deal. And, of course, they’re working for you at nearly all hours of the day and night—whether you need more info on a home or just someone to talk to in order to feel at ease with the offer you just put in. This is the biggest financial (and possibly emotional) decision of your life, and guiding you through it isn’t a responsibility Realtors take lightly. 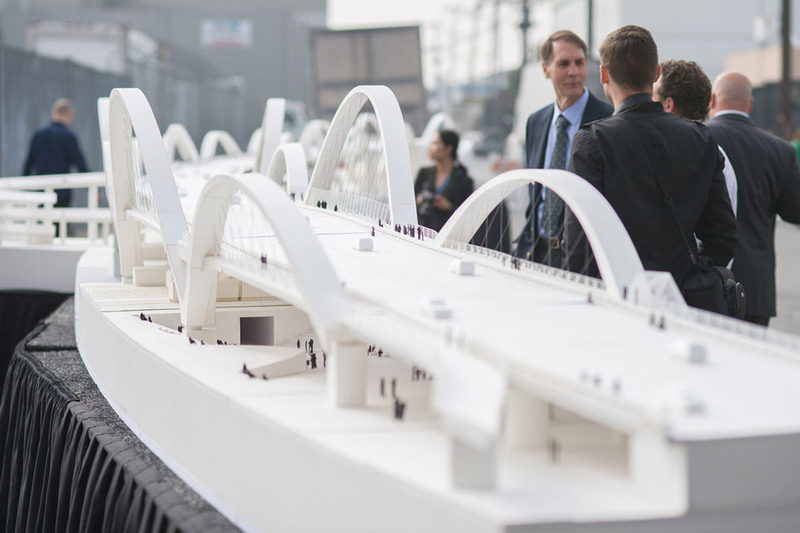 Work starts this week on a huge bridge made up of 10 pairs of arches, designed by architect Michael Maltzan to replace the iconic Art-Deco Sixth Street Viaduct in Los Angeles (+ slideshow). 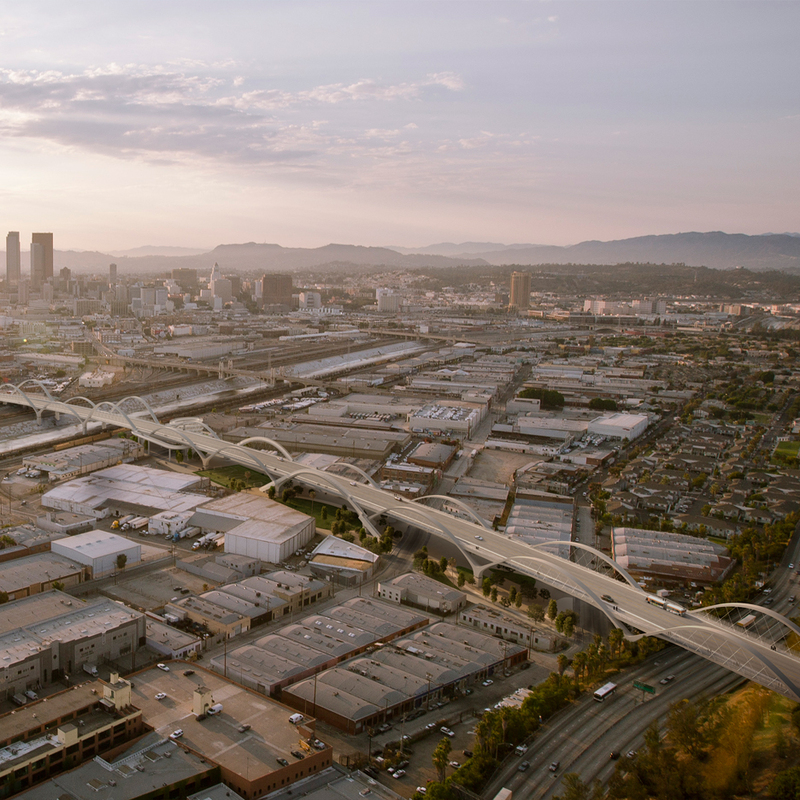 Called the Ribbon of Light, the 3,500-foot-long (approximately 1,100 metres) bridge will span the Los Angeles River and several busy roads, providing pedestrian, bicycle and vehicular access to downtown LA from the Boyle Heights neighbourhood. Demolition will begin on the existing bridge on 5 February, necessitating a 40-hour closure of the 101 Freeway. The new elevated structure will feature a series of splayed arched trusses that will be illuminated at night. 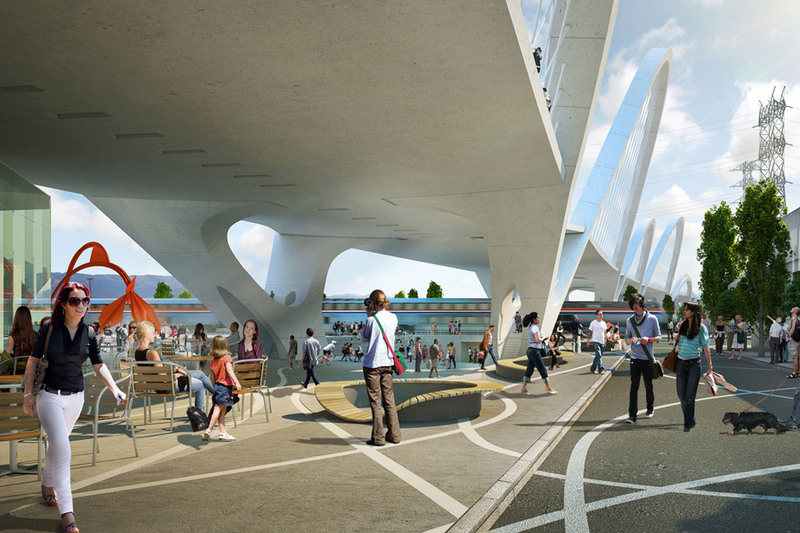 It will connect to a network of parks being developed alongside and underneath it. Five staircases will allow pedestrians access at different points along the span, while a ramp at either end will provide accessibility for cyclists. 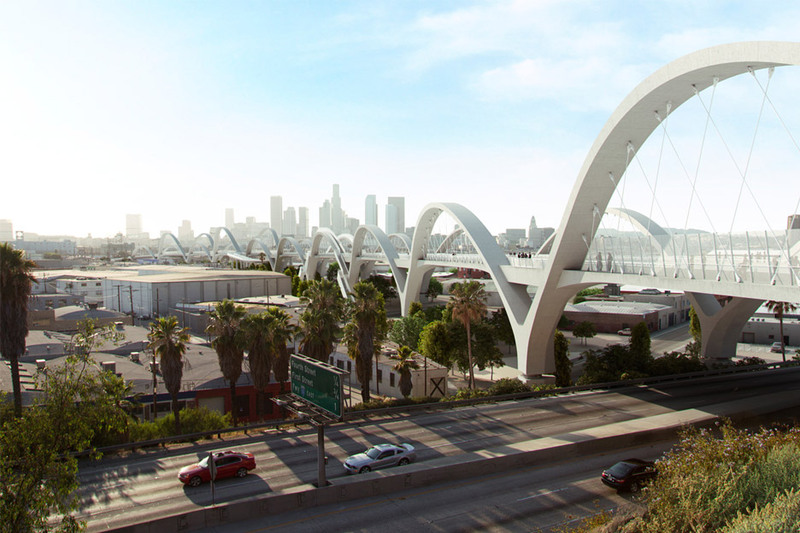 “The new Los Angeles Sixth Street Viaduct is a transformative infrastructure project for the city of Los Angeles,” said LA-based Michael Maltzan Architecture, describing it as “more than a simple replacement thoroughfare”. 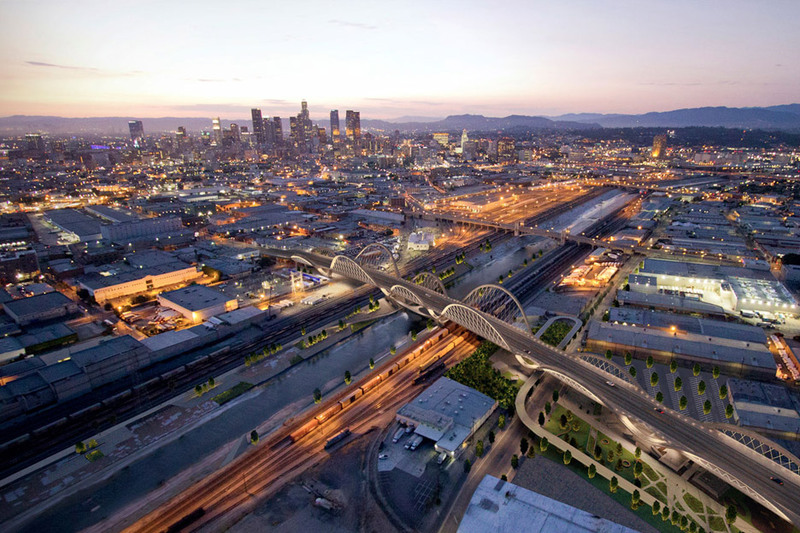 “The project foresees a multimodal future for the city, one that accommodates cars, incorporates significant new bicycle connections, and also increases connectivity for pedestrians to access the viaduct, not only at its endpoints, but along the entirety of the viaduct, linking the bridge, the Los Angeles River, and future urban landscapes in a more meaningful relationship,” it said. The existing Sixth Street Viaduct dates back to 1932 and has been featured in numerous films, particularly those revealing the city’s underside, including Drive, The Dark Knight Rises, and To Live and Die in LA. Though the old Art-Deco bridge is a landmark, it has badly deteriorated due to a chemical reaction known as Alkali Scilica Reaction, which is eroding its concrete piers. It also fails to meet current seismic standards. Maltzan’s firm designed the replacement bridge with architecture and engineering firm HNTB and engineering company Skanska. 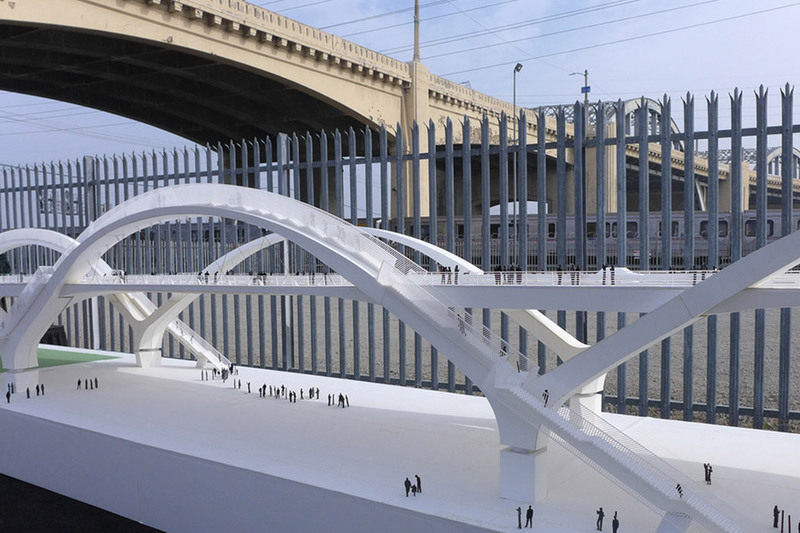 “These pairs of repeated concrete arches and cable-supported roadway deck are simultaneously elegant and efficient,” Michael Maltzan Architecture said. 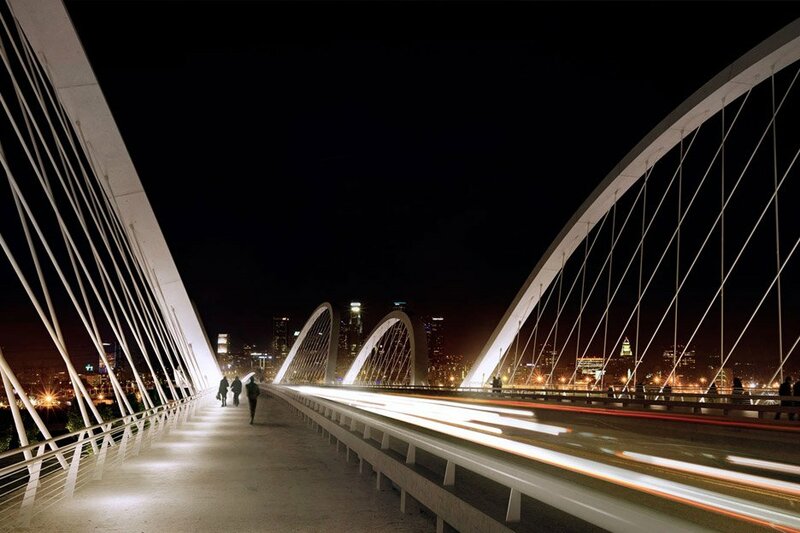 “The design approach unifies and optimises the architecture of the viaduct through repetition, creating a unique configuration through the repeated use of arches, roadway and pier forms: an iconic structure,” the firm added. 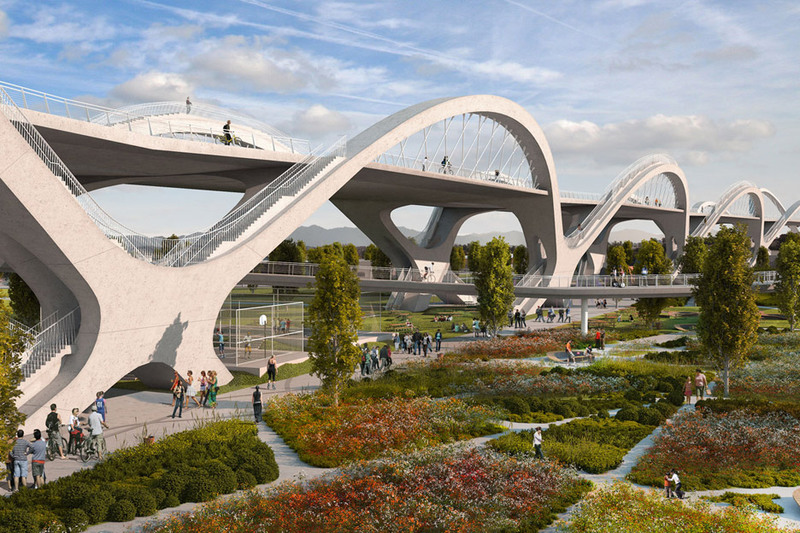 The LA River is currently a concrete channel, but is in the process of being redesigned with more natural edges as a park and recreation area, with Frank Gehry currently attached to the design team. The Ribbon of Light is the latest in a string of major building projects in LA, helping to turn the city into a hotbed for design. Other examples include The Broad by Diller Scofidio + Renfro and the renovated Petersen Automotive Museum. “The unwieldiness, the heterogeneity, the complexity here – all those things you might associate with dystopic urbanisms have made things like invention very possible. They’ve created a very open context,” Maltzan told Dezeen. 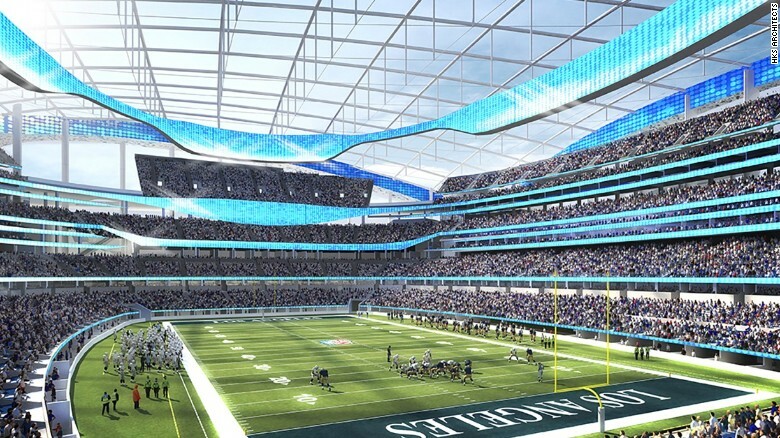 (CNN) Los Angeles will welcome the return of NFL football with the construction of a new 80,000-seat stadium complex and “NFL Disney World,” expected to become the world’s most expensive sports arena. The 300-acre development in Inglewood, a few miles from downtown Los Angeles, will provide a new home for the NFL’s Rams franchise, whose return to their former home city was approved by league officials last Tuesday. The development has an estimated cost of $2.6 billion — more than $1 billion more than New Jersey’s MetLife Stadium, currently the league’s most costly venue. The capacity of the new stadium could exceed 100,000 for special events, say developers. Inglewood Mayor James Butts has already announced ambitions to host the Super Bowl at the arena, which developers say will be the “cornerstone” of a year-round sports, music, and entertainment events district. An unnamed “owner” is reported in the Los Angeles Times comparing their ambitions for the development to Florida’s Disney World theme park. The development’s footprint is about twice the size of the original Disneyland Resort in Anaheim, California, and will also host a 6,000-seat performance venue, more than 1.5 million square feet of retail and office space, 2,500 homes, a 300-room hotel, and 25 acres of parks. The Rams, who played in the Los Angeles area for almost 50 years, will give the city its first NFL team since 1995 — the year the Rams left for St. Louis, and the Raiders departed for Oakland. Rams owner and property developer Stan Kroenke, who has an estimated personal net worth of $7.4 billion, is credited with spearheading the return of NFL football to the country’s second largest city. The new stadium is expected to be complete in time for the 2019 NFL season, with the team playing at their former home at the L.A. Memorial Coliseum, until then. The team’s owners have begun courting the San Deigo Chargers and Oakland Raiders to join them at the new venue, on the site of the former Hollywood Park horse racing track. International architecture giant HKS have been contracted to design the venue and have announced that it will center on a 19-acre transparent canopy, which will cover the entire stadium and parts of the surrounding development. The canopy will be made from the same transparent ETFE plastic that coats Bayern Munich’s stadium, the Allianz Arena, and the Beijing National Aquatics Center. Munich’s stadium changes color, from red to white to blue, according to which team — Bayern, second division side TSV 1860 München, or the German national side — is playing at the stadium that day. 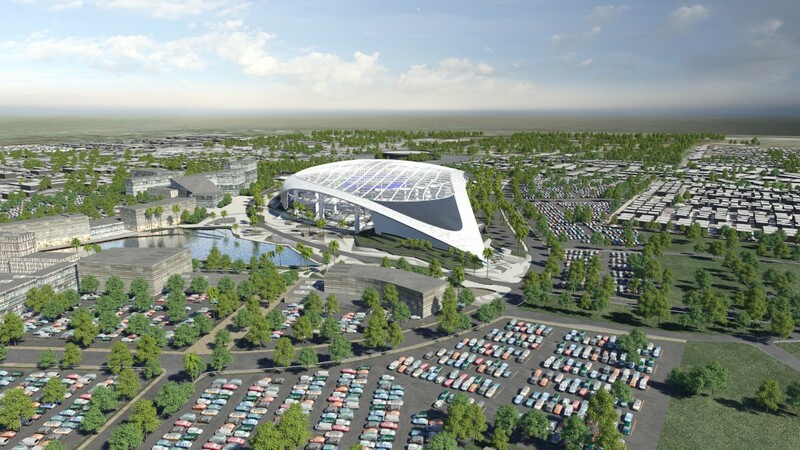 The architects have not yet said if similar color indication would occur if two or more teams host matches at the new stadium in Inglewood. The Rams are urging the Chargers, currently based 200 km south of L.A. in San Diego, to join them at the stadium, and fund a portion of the massive costs, with the Oakland Raiders considered a fallback option. Kroenke has publicly estimated the cost at $1.86 billion, but the Los Angeles Times quotes unnamed “(NFL) officials and owners” who say the true cost could reach $2.66 billion. The New York Times and others have put the value at nearly $3 billion. The NFL already claims the world’s most expensive stadium. That title belongs to the MetLife Stadium in East Rutherford, New Jersey, home to New York teams the Giants and Jets, which opened in 2010 at a cost of $1.6 billion. The Dallas Cowboys and San Francisco 49ers are also among a minute group of teams worldwide to play in stadiums costing more than $1 billion. Outside the U.S., stadiums with budgets exceeding $1 billion dollars are rare. London’s home of soccer, Wembley Stadium, crossed the mark in 2007. Tokyo abandoned plans for a $2 billion Zaha Hadid-designed stadium last July amid rising costs, with a cheaper design now underway. The ancient Romans didn’t have reinforced concrete (that is, strengthened with steel) but they had concrete, and used it to such heart-stopping effect on the Pantheon that no one has really been able to match it since. The true moment of genius is the way in which, after a certain amount of harrumphing with Corinthian columns and marble decoration at its lower levels, the design resolves itself into the pure circular oculus at its top, unglazed, which causes a beam of light to rake around the interior like an internalised sun. Concrete has the ability to be primitive and technological, massive and levitating, to combine the properties of steel with those of mud. Le Corbusier knew how to run the gamut of its expressive range better than anyone. He used it as the medium for translating his fascinations both with aeroplanes and other modern machines and with ancient landscapes and temples. His Unité d’Habitation, a massive apartment building in Marseille, is both a liner floated to its site from the nearby Mediterranean and a chunk of the surrounding mountains, rectangularised, ark and Ararat at once. Many architects and engineers have exploited the ability of reinforced concrete to produce structures of exceptional apparent lightness which, despite being made of a form of masonry, hardly seem to touch the ground. Quite a few have used arches and vaults in the form of parabolas, which direct the structural forces inside the material with particular efficiency, which makes the structure lighter still. Félix Candela was one of the earliest and best to pursue these ideas. The anti-gravity effects of the Los Manantiales restaurant were particularly magical. Bank of London and South America, Buenos Aires… ‘creates both enclosure and openness’. The Italian-Argentinian architect Clorindo Testa wasn’t particularly interested in getting concrete to look light, at least from the outside, instead heaving it out of the ground into an extraordinary structure that has something of a dinosaur’s skeleton. Yet it still manages to achieve a civilised rapport with the neo-classical facades around it. It also forms a perforated carapace that filters sunlight to the interior and creates both enclosure and openness. It unexpectedly ends up having some of the qualities of a Japanese screen, if with considerable added tonnage. A slightly gauche attempt to realise the principles of gothic architecture in reinforced concrete but at the same time endearing and heroic. The church was sufficiently ahead of its time that building codes hadn’t caught up, which meant construction had to be delayed while a demolition order was removed. De Baudot didn’t quite work out that you can achieve gothic lightness of construction without gothic details such as pointed arches and vaults. Auguste Perret would later do this with the radiant Notre Dame du Raincy, but Saint-Jean-de-Montmartre makes the list by virtue of being a pioneer. A swimming pool, indoor football pitches and other sports courts are stacked up in the fattest of this group of three towers; changing rooms are in another, linked by dynamic bridges, which transforms the normally humdrum movement from cubicle to playing zone into urban theatre. The third, cylindrical, tower stores water. Knowing that a change of political wind could blow away socially minded projects like this, Bo Bardi made it fortress-like: a citadel of liberty, it was called. The window openings, which seem punched out by a caveman, are amazing. Álvaro Siza is one of the less declamatory and more subtle contemporary architects, which makes this moment of theatre all the more striking. He takes a sheet of concrete and drops it like a pocket handkerchief between two rectangular blocks. The special properties of reinforced concrete, in particular its abilities to hang as well as vault, and achieve high strengths with minimal thickness, are used to the full. A classic of making design look effortless, when the engineering and construction that goes into it is anything but. By the 1990s it might have been thought that the list of Things to Do With Concrete had been exhausted. Herzog and de Meuron, however, came up with something new, which was to print an eclectic set of images, selected by the artist Thomas Ruff, on to the material. The same images were also printed on horizontal bands of glass, set flush with the concrete, which by day gives the library’s simple oblong shape an apparently homogeneous surface. By night the transparent parts light up and the solid parts don’t, which creates an opposite impression. A rare error in the smooth-running 10 best machine allows a late entry, a church by the Bauhaus alumnus Marcel Breuer deep in the midwest that makes many tonnes of concrete into mineral origami. I am indebted to a reader, Rolf Erikson, for pointing this project out. Fans of Louis Kahn clamouring for his inclusion won’t be pleased, though. Kahn was indeed magnificent and it was a tough call to leave him out. But the Breuer is more concrete-y. Apologies to Tadao Ando, Denys Lasdun, Robert Maillart, Oscar Niemeyer, Zaha Hadid, Rachel Whiteread, Pier Luigi Nervi, Frank Lloyd Wright, and Sverre Fehn, all of them magicians with concrete who deserve a place in a top 10. But the last slot goes to a house on a promontory where difficulties of access limited niceties in construction. The result is a structure whose cubic purity is offset by roughness in its substance, and where the traces of the timber moulds of its concrete give it the feeling of an unusually exalted wooden shack. Still, the real estate frenzy cooled through late summer and fall. To what extent the slowdown could be blamed on the typical seasonality of home sales or to the price hikes that have made housing increasingly unaffordable is unclear. A better picture of the market’s health should emerge during the busy spring buying season. “Affordability is dulling demand,” said Leslie Appleton-Young, chief economist for the California Assn. of Realtors, which projects the state’s median home price to increase 3.2% this year, about half the pace of the 6.2% gain in 2015. For now, many of Los Angeles County’s hottest burbs fall into two categories: Westside areas in the midst of a tech-industry boom and communities near downtown coveted for their older homes and short drive to an increasingly vibrant city center. Even with the demand, some of these neighborhoods are seeing sales fall amid a lack of inventory, but Appleton-Young said they are likely to see further price growth. And despite affordability constraints, she’s bullish on Southern California’s housing market for the year. To gauge L.A. County’s hottest neighborhoods, The Times ranked them by the change in the median price per square foot for a single-family home. The median is the point at which half the homes are sold for more and half for less. The per-square-foot metric was chosen to best account for changes in the sizes of homes selling, such as older smaller houses that are desirable but have relatively lower price tags. The ritzy neighborhood north of Montana Avenue saw the largest gain last year. At $1,420 a foot, that’s the equivalent of $2.84 million for a 2,000-square-foot house. Known for larger homes than other city neighborhoods, the area has long attracted those looking for a spacious spread near the beach. More recently, the neighborhood has grown even more exclusive amid a surge of international buyers and executives from the growing Silicon Beach tech hub, said Tregg Rustad, a real estate agent with Rodeo Realty. “It’s not just Asia, it’s South America, Russia — the stability of the housing market compared to some [of foreigners’ other investment options] is very strong,” he said. Also fueling the appreciation are developers picking up smaller, older homes at a premium so they can tear them down and build modern mansions. The surge in these smaller tear-downs helps explain why median per-square-foot price soared while the overall median for existing single-family homes dipped, Rustad said. Agent Tracey Hennessey said she sees values continuing to skyrocket.“We are seeing more and more money coming into Santa Monica like never before,” she said. Strong demand, tight inventory, good schools and a view of the Pacific made Hermosa Beach a real estate standout in 2015. The small South Bay town also has something else going for it: It’s not Manhattan Beach. Wealthy families priced out of increasingly ritzy Manhattan Beach — with its median price of $2.1 million — are looking to the next town over. But that’s pushing up values in a city that’s had more of a reputation as a younger party town, agents said. “A lot of people are moving here from Silicon Beach,” he said. The neighborhoods north of downtown L.A. have seen values soar for decades — Silver Lake, then Echo Park, followed by Highland Park. As one neighborhood grows increasingly expensive, people priced out look the next block over, sparking debate over the gentrification of the working-class communities. Now the same appears to be happening in 90031, which includes Lincoln Heights and parts of Elysian Valley and the more expensive Montecito Heights. Demand in Elysian Valley, a small neighborhood sandwiched between the L.A. River and the 5 Freeway, has been robust, in large part due to investors looking to capitalize on plans to revitalize the waterway. “Investors realize this area is on the up-and-coming. Investors working in the Eagle Rock, Highland Park area are now shifting focus to this area as well,” said agent Mark Diffie, who added that the influx has unnerved some longtime residents. In the larger area of Lincoln Heights and Montecito Heights, between the 10 and 110 freeways, prices are rising as well. Jennifer Wenzlaff, an agent with Redfin, said would-be Lincoln Heights buyers are a mix of investors, singles and families. In her experience, many are renters in Silver Lake, Culver City and Echo Park, where they can’t afford to settle down. “My clients that love Highland Park – and unfortunately are priced out – are starting to look around,” she said. Forces similar to those in Lincoln Heights also are at play in City Terrace. The hillside community in unincorporated East Los Angeles has seen an influx of demand that’s pushed prices up, said Camilo Valentin, a co-owner of Red House Realty Inc. Buyers have been a mix of those from outside the neighborhood looking for a relatively affordable Spanish Colonial near downtown, and former locals who went off to college or left for a job and are returning to put down roots of their own. Investors also are a heavy presence. “You still get a bang for your buck — $325,000 with views of downtown L.A. You can actually see the Hollywood sign from City Terrace,” Valentin said. Other East L.A. areas in 90063 have also seen increased demand lately, but not to the extent of City Terrace, Valentin said. He expects prices to climb higher there and for longtime owners to cash in, repeating a process that has played out in nearby Highland Park and other close-by neighborhoods. Another beachfront Westside neighborhood, another tech story. The flourishing online businesses that have created a wealth of jobs in nearby Santa Monica, Venice and Playa Vista have added an influx of buyers to an up-and-coming area, real estate agent Tami Pardee said. While the marina had been relatively sleepy compared to next-door Venice, that’s changing, she said. New restaurants and stores are opening; the county is planning a massive renovation of its maritime, entertainment and hospitality attractions; and housing developers have projects in the works. “People are finally opening their eyes to it, it’s cleaner, it’s friendlier,” Pardee said. Manhattan Beach long ago ditched its reputation as a sleepy beach town. Professional athletes, tech executives, Hollywood types and other high-income earners are drawn to this city by its beach lifestyle, good schools and gourmet restaurants. But buyers on the hunt for a home find all that competition means there are few for sale and at top prices. The median price for an existing single-family home hit $2.1 million last year, up 10.1%. The median price per square foot grew about twice as fast to $1,021. Developers are also playing a role in driving up prices, buying a dwindling supply of cottages and throwing McMansions up at a rapid pace. Real estate agent David Keller said he sees the dynamic holding steady, given the extremely low inventory in the city and lack of room for new development. “I don’t think anything will change dramatically anytime soon — unless there’s some sort of economic catastrophe,” he said. Compton was an epicenter of the housing bust as buyers who financed their homes with subprime loans went belly up. But prices have been rebounding for years, as has the city’s reputation. Crime has plummeted and after once shunning the city, large retailers have moved in. Families from the South Bay and Long Beach areas are increasingly looking to Compton for a cheaper home, real estate agent Lulu Robles said. Families are doubling up — parents and a grown child with their spouse isn’t uncommon — to afford the mortgage. Low interest rates and down-payment programs also are giving more families the ability to buy, she said. All of the demand has helped two neighborhoods — 90220 near north Carson and the adjacent 90222 near Willowbrook — see some of the strongest price growth. Investors also have scooped up many homes to renovate, lifting values for those properties and the surrounding neighborhood, Robles said. “It’s helping the area come up in pricing,” she said. Real estate in this relatively low-key beach-side neighborhood at the end of Culver Boulevard is red hot. The culprits? Strong job growth and a dearth of homes for sale. In particular, demand is heavy from workers in the growing technology and advertising hubs of nearby Playa Vista, agents say. In some cases, prices — at least on a nominal basis — have risen past those seen during last decade’s housing bubble, agent Jane St. John said. For example, she said she recently listed a home for a client at $2.8 million. In 2006 — amid the housing bubble — it changed hands for $2.6 million. The San Fernando Valley has not experienced the pace of price increases of some other areas. But it’s not a surprise that Toluca Lake and Studio City are standouts. The area has long been attractive to Hollywood executives and wealthy families looking to be near elite private schools. More recently, Studio City has become a hot spot for young urban professionals amid an explosion of bars and restaurants. And with all the talk of the Federal Reserve hiking interest rates, real estate agent Matt Epstein said many buyers decided that it was time to make their move. He said developers also are shelling out for older homes to renovate or tear down to build towering replacements. “Developers are willing to pay a premium,” he said. The flood of activity here — like the market as a whole — has slowed its pace in recent months, but Epstein doesn’t foresee a bubble about to pop. “I don’t see prices going down, but leveling out,” he said. As an award-winning real estate professional with 20 years of experience, Italian native Marco Rufo has represented clients all over the world. But it’s his work in Pacific Palisades as a Broker Associate and Luxury Properties Specialist with Berkshire Hathaway HomeServices that keeps the Sunset Mesaresident passionate about his career today. For Rufo, who began in the commercial arena and transitioned to residential real estate, the excitement of closing deals on multi-million-dollar residences in the Palisades is rivaled only by one thing: the joy he gets from his family. The self-professed family man recently chatted with the Palisadian-Postabout his upbringing, his career path and what he and his loved ones like to do when he isn’t helping clients buy or sell their dream homes. Jacqueline Primo: Tell me about your upbringing, as well as where you went to college and what you studied. Marco Rufo: My family immigrated to this country from Italy when I was about 7 years old. I was born in a small town called San Donato, which is about 60 miles southeast of Rome. At home as a child my language was Italian, and after coming to the United States, I grew up in West Newton, a suburb of Boston, Massachusetts. Growing up I worked for my father’s construction company, building and designing homes throughout Boston. I went to school in Newton until I was 17 years old, at which time I moved to Los Angeles to attend UCLA. I studied business and minored in theater, living in Westwood while I was attending school. Primo: How did you get your start in real estate and how did your career progress from there? How did you come to work with Berkshire Hathaway HomeServices? Rufo: I started my real estate career in commercial real estate in Beverly Hills, where I lived from 1992-2008. I worked for myself and was involved in selling/buying over $400 million in transactions. I specifically represented a Japanese conglomerate, and I became their exclusive real estate broker. We bought hotels (in Hawaii and Beverly Hills), resorts (in Canada, Palm Springs and San Diego) and many office buildings, the largest being the AT&T building in downtown LA for $96 million. My commercial real estate days ended in the late ’90s, at which time I transitioned into residential real estate. I was part owner of a Century 21 office in LA and managed about 120 real estate agents. I sold my share to my partners in 2003. Then in 2004, I became one of the managers at Sotheby’s International Realty in Santa Monica and worked there for about three years. I then moved to Pacific Palisades and was the Managing Broker for Miramar Coastal Properties for about three years and finally around the end of 2010 I started working for Prudential California Realty in Pacific Palisades, which is now Berkshire Hathaway HomeServices. Primo: What brought you to LA, and to Pacific Palisades specifically? Rufo: When I lived in Beverly Hills I had purchased a piece of land in Malibu and built a 4,000 square-foot brand new traditional home, which I sold in 2013. During that process I landed in Pacific Palisades and purchased another piece of property, tore it down and built the 3,300 square-foot home in Sunset Mesa, where I currently live. Primo: What does it mean to be a Luxury Properties Specialist? Rufo: Luxury Properties Specialist is a designation to Brokers/Agents who sell property over a price-point of $3 million. My average sale is actually $4.5 million. Primo: Tell me about how you approach new clients who are aiming to buy or sell a home. Rufo: Approaching new clients is a process; it starts with a series of questions. If you represent a buyer: 1) What do your finances look like? 2) Are you married or single? 3) What’s your timeframe? 4) How does your credit look? 5) What type of home/condo are you looking for and in what area? If you represent a seller: 1) Why do you want to sell? 2) Where will you go? 3) How long have you lived here? 4) What’s your mortgage, if you have one? 5) How does your family feel about selling? These questions are just the beginning. There are so many more. Primo: What are some of the awards and accreditations you have earned throughout your 20 years of industry experience? Rufo: I currently hold the following positions: 1) Director three years running at the Beverly Hills Greater Los Angeles Board of Realtors, and I have just been re-elected for another three years. 2) President of the Professional Standards Committee for the Beverly Hills Greater Los Angeles Board of Realtors, which is in charge of all arbitrations and mediations for the Board of Realtors. 3) President of the Grievance Committee for the Beverly Hills Greater Los Angeles Board of Realtors, which reviews and decides on all potential cases presented to the Board for hearing or dismissal. 4) I hold National Association of Realtors designations: e-PRO, GRI, ABR, CRS and SRES. Primo: What do you and your family like to do for fun? Rufo: My family is a big part of my life. I met my wife Paula in 2001 and we were married in 2003. We have two beautiful girls: Alexa, 10, and Olivia, 7. Both girls go to Corpus Christi School, which is right across the street from my office and that was very important to me. I spend a lot of time with my girls. We love water sports in the summer, soccer, tennis and skiing in the winter. We just returned from Vail, Colorado and the skiing was amazing. I live for my girls! I am very involved in their schooling and homework, and I make sure that every night we are together and there is a routine. I find my family is the joy of my life. To close a sale in real estate, opportunity favors a charged phone. Three years ago, real estate agent Jordan Clarke was traveling north on Interstate 5 when he received a panicked call from clients in Washington, D.C., to say a home in Del Mar had just gone on the market. The countdown had begun. There are few homes for sale in the affluent coastal city, and, chances are, other agents had clients interested too. Clarke pulled off the freeway, called the listing agent, got into the home and pulled out his cellphone. Step by step, he marched through the remodeled home, showing live video to his East Coast clients of hardwood floors, two fireplaces, a designer kitchen and large windows. Impressed by what they saw, they made an offer. In just a few hours, the home sold for $1.1 million — beating out a higher offer an hour later from another agent. Many agents have used video streaming with buyers, primarily through apps such as Skype, FaceTime and Periscope. Now, real estate brokerage Redfin is taking it a step further. Since July, Redfin’s website and phone app have allowed users to select the Live Video Tour function to have an agent take them through the home with his or her phone. It is the first time a real estate company has set up live streaming connected directly to a listing. “You are able to direct [an agent] just like you’re there,” said Clarke, a Redfin agent. The feature is available only in San Diego and Chicago but may expand to other markets in 2016. Redfin says it has been mostly local buyers who have had a long day at work and don’t have the time, or energy, to go to a listing in person. The way it usually works is an interested buyer goes on the Redfin website, selects the time they want to see a video feed, and the agent goes to the property with a phone. Then, agents walk up to the property while talking about its features. Inside, the agent shows off different areas until the user asks for close-ups or to go back. Fred and Lori Clark of Albuquerque, N.M., had tried for years to move to San Diego County but kept losing out when their offers weren’t accepted. In September, Fred, 71, and Lori, 75, spotted a home on the market in Oceanside listed by Redfin. They were unable to fly out before another offer was made, so the agents encouraged them to get on their computer. The Clarks set up Skype online, and Redfin agents walked them through the property with their phones. From the comfort of their New Mexico home, they made an offer. It closed two weeks later for less than the asking price of $480,000. Mark Goldman, a finance and real estate lecturer at San Diego State University, said the industry is quick to adapt to new technologies. He is old enough to remember the excitement over the fax machine. Goldman said the lack of new home inventory would continue to push the industry to innovate and be aggressive. Single-family homes in San Diego County have sold in an average of 40 days this year, down from 45 days in 2014, Multiple Listing Service said. In areas where home values are rising fastest, it can get more extreme. In Imperial Beach, homes are staying on the market an average of 26 days this year before they are sold. Just 23,000 new homes have been constructed in San Diego from 2012 to 2015, despite 101,000 jobs created, economist Lawrence Yun noted at a national Realtor conference in San Diego recently. Realtor Jason Cassity, who works with sellers and renters at City Consulting Group downtown, said he has been using video streaming, mainly through Periscope, for three years but mostly for rentals. “People aren’t as afraid to commit to a one-year lease at $2,000, compared to dropping $600,000,” he said of viewing places by phone. For Cassity, video streaming may already be a thing of the past. He said he prefers 3-D modeling platform Matterport (also used on Redfin listings), which allows companies to take detailed 360-degree photos inside a property. Potential buyers can scroll through a home, similar to using Google Maps on streets. The costs for agents can add up. Cassity said a recent Matterport filming of a 1,100-square-foot condo cost $350. Add that to $150 for photos and $600 for video. However, he said the commission on a house sale is worth it. LOS ANGELES, Dec. 8 (Xinhua) — Greenland USA, a branch of China’s real estate developer Greenland, held on Tuesday the “topping out” ceremony of its first residential tower in downtown Los Angeles, placing the last steel beam on the 38-story tower. It is also the first residential tower of the 1-billion-U.S.-dollar Metropolis project. Located in downtown Los Angeles, the 6.3-acre(25495.2 square meters) project features three residential towers and a boutique hotel. “To reach its full potential as an urban destination, it is critical that downtown Los Angeles expand its population beyond nine-to-five workers to 24/7 residents,” said Taotao Song, general manager, Los Angeles, Greenland USA. Residents could move into the first tower which houses more than 300 homes as early as the end of 2016, according to Song. To mark the moment, Greenland USA’s employees, partners and more than 500 construction workers signed the last beam. Over the nearly three year construction period from 2014 to 2016, more than 2,200 full-time equivalent jobs have been created to support the development of Tower I, and more than 10,000 full-time equivalent jobs will be created for the property as a whole, according to Greenland USA. “We worked hand-in-hand with Greenland USA to take this site from a parking lot to top-off in just under two years,” said Mark Turner, senior vice president of the construction contractor Webcor. Filed Under: Marco's Blog Tagged With: " said Gang Hu, " said Mark Turner, " said Taotao Song, 000 full-time equivalent jobs will be created for the property as a whole, 200 full-time equivalent jobs have been created to support the development of Tower I, a branch of China's real estate developer Greenland, a project that will truly change the skyline of Los Angeles, according to Greenland USA. "We worked hand-in-hand with Greenland USA to take this site from a parking lot to top-off in just under two years, according to Song. To mark the moment, and more than 10, Dec. 8 (Xinhua) -- Greenland USA, general manager, Greenland USA's employees, Greenland USA. "Once complete, Greenland USA. Residents could move into the first tower which houses more than 300 homes as early as the end of 2016, held on Tuesday the "topping out" ceremony of its first residential tower in downtown Los Angeles, interim CEO, it is critical that downtown Los Angeles expand its population beyond nine-to-five workers to 24/7 residents, los angeles, Metropolis will invigorate the immediate area and create a whole new dynamic to downtown." "To reach its full potential as an urban destination, more than 2, partners and more than 500 construction workers signed the last beam. Over the nearly three year construction period from 2014 to 2016, placing the last steel beam on the 38-story tower. It is also the first residential tower of the 1-billion-U.S.-dollar Metropolis project. Located in downtown Los Angeles, senior vice president of the construction contractor Webcor. "We're thrilled to take this moment to recognize our team for their hard work and dedication in bringing Metropolis, the 6.3-acre(25495.2 square meters) project features three residential towers and a boutique hotel. "As Greenland USA's first acquisition, the top-off of the first tower at Metropolis is a particularly proud moment for us, to life." The number of real estate appraisers is falling. The ranks of real estate appraisers stand to shrink substantially over the next five years, which could mean longer waits, higher fees and even lower-quality appraisals as more appraisers cross state lines to value properties. There were 78,500 real estate appraisers working in the U.S. earlier this year, according to the Appraisal Institute, an industry organization, down 20% from 2007. That could fall another 3% each year for the next decade, according to the group. Much of the drop has been among residential, rather than commercial, appraisers. Some say Americans are unlikely to feel the effects right now, as it’s mostly confined to rural areas and the number of appraisal certifications — many appraisers are licensed to work in multiple states — has held relatively steady. Others say it’s already happening, and rural areas are simply the start. Since most residential mortgages require an appraiser to value a property before a sale closes, they say, a shortage of appraisers is potentially problematic — and expensive — for both home buyers, who rely on accurate valuations to ensure that they aren’t overpaying, and sellers, who can see deals fall through if appraisals come in low. As appraiser numbers are falling, the pool is aging: Sixty-two percent of appraisers are 51 and older, according to the Appraisal Institute, while 24% are between 36 and 50. Only 13% are 35 or younger. Industry experts blame an increasingly inhospitable career outlook. Financial institutions used to hire and train entry-level appraisers, but few do anymore, according to John Brenan, director of appraisal issues for the Appraisal Foundation, which sets national standards for real estate appraisers. That has created a marketplace where current appraisers, mostly small businesses, are fearful of losing business or shrinking their own revenue as they approach retirement. Many have opted not to hire and train replacements. The requirements to become a certified residential appraiser have also increased over the past couple of decades. Before the early 1990s, a real estate license was often all that was needed. Today, classes and years of apprenticeship are required for certification. “If you come out of college with a finance degree, you can work for a bank for $70,000 [or] $80,000 a year with benefits,” said Appraisal Institute President Lance Coyle. “As a trainee, you might make $30,000 and get no benefits.” For some, especially those with student loans to pay, the choice may be easy. “There were definitely easier options of career paths I could have chosen,” said Brooke Newstrom, 34, who became an apprentice for Steinley Real Estate Appraisals earlier this year. She networked for a year and a half, cold calling appraiser offices and attending professional conferences, before getting the job. For residential appraisers, business isn’t as lucrative as it once was. Federal regulations in 2009 led to the rise of appraisal management companies, which act as a firewall between appraisers and lenders so appraisers can give an unbiased opinion of a home’s value. But those companies take a chunk of the fee, cutting appraiser compensation. Some community lenders don’t use appraisal management companies, according to Coyle, but they are often used by mortgage brokers and large banks. Appraiser numbers appear poised to continue shrinking, and as appraisers continue to get multiple state certifications they may be stretched more thinly, industry experts say. For now, any shortages are likely regional, Brenan said. “There are certainly some parts of the country — and primarily some rural areas — where there aren’t as many appraisers available to perform certain assignments that there were in the past,” he said. Elsewhere, however, the decrease in appraisers isn’t felt as acutely. In Chicago, according to appraiser John Tsiaousis, it may be difficult for young appraisers to break in but customers in search of one shouldn’t have a problem. The effects of an appraiser shortage could be substantial for individuals on both sides of a real estate transaction, experts say. Longer waits also affect sellers who need the equity from one sale to purchase their next home. When they can’t close on the home they’re selling, they can’t close on the one they’re buying. A shortage also means appraisals will likely cost more, which some say is already happening in rural areas. Appraisal fees are generally paid by borrowers. “Appraisal fees in areas where there aren’t enough appraisers are higher than those areas where there are plenty of people to take up the cause,” said Steinley, who holds leadership roles in the Appraisal Institute and the Association of Appraiser Regulatory Officials. There is a quality issue, too: In some areas, appraisers come in from other states to value homes. While there are guidelines for these appraisers to become geographically competent, they could miss subtleties in the market, Coyle said. And if the shortage isn’t addressed, and lenders are unable to get appraisers to value homes, lenders might ask federal regulators to relax the rules governing when traditional appraisals are needed, allowing more computer-generated analyses in their place, according to Steinley. Automated valuation models, which are less expensive and quicker, are rarely used for mortgage originations today, Coyle said. They’re sometimes used for portfolio analysis, or when a borrower needs to demonstrate 20% equity in order to stop paying for private mortgage insurance, he added. They might be used for low-risk home-equity loans, Brenan said. Currently, appraisers are required for mortgages backed by the Federal Housing Administration, Fannie Mae and Freddie Mac. Those mortgages make up about 70% of the market by loan volume and 90% of the market by loan count, according to the Mortgage Bankers Association. And computer-generated appraisals can’t match the precision of one conducted by someone who has seen the property, and knows the area, many in the industry say. The industry is beginning to address the issue. Last month, the Appraisal Foundation’s qualifications board held a hearing to gather comments and suggestions, Brenan said. One of the options being discussed: Creating a set of competency-based exams that could shorten the time people spend as trainees. That way, someone with a background in real estate finance could become certified more quickly, Steinley said. The board is also looking to further develop courses that would allow college students to gain practical experience before graduation, Brenan said.